Growing up as a preacher's kid in the south, church played a pivotal role in Lindsey Wingo's childhood. Her Christian faith continues to be the driving force behind everything she does. She teaches women's bible study at her church and is passionate about helping women seek and embrace God's true calling in their lives. Married to her high school sweetheart, Lindsey earned her Bachelors Degree in Public Relations/Advertising. She worked as the Membership and Marketing Director at the YMCA before quitting that job to stay home full-time with her three children. Shortly after having her first two children, she started a blog for moms called Missional Motherhood. The vision behind the blog is to give moms from all walks of life a place to share their stories and encourage one another, using Christ as their compass. While Lindsey is no longer the primary editor of the blog, it is still up and running, thanks to a dedicated team of women carrying on Lindsey's mission. 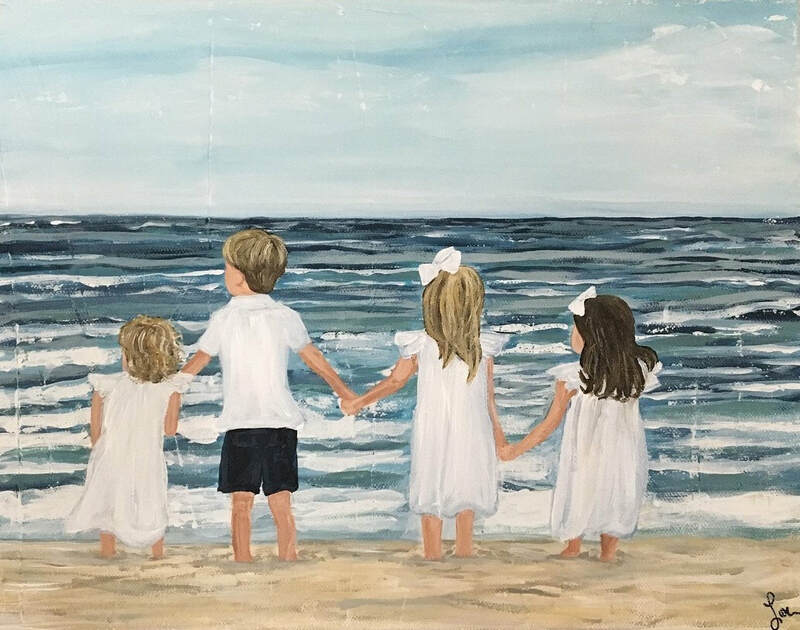 About a year and a half ago, Lindsey began painting as a way to unwind at the end of the day, and to create keepsakes that would remind her of the special moments she shares with her children. Her interest in painting, which started as a hobby, has unexpectedly turned into a small business. Some of Lindsey's most popular pieces are custom creations based on personal photos, hand-painted silhouettes, and seasonal designs such as buffalo check pumpkins and Nativity paintings. As a self-taught artist, Lindsey has mostly mastered her painting skills through trial and error. She's picked up a few tips thanks to tons of research, painting books and the guidance of other artists, but her pieces represent an authenticity that was mostly honed by Lindsey herself. Check out Lindsey's full collection of paintings on Instagram at @loupaints. In addition to playing the roles of wife, mother, bible study teacher and painter, Lindsey is also co-owner of the North Carolina seasonal children's consignment sale, Twice As Nice Kids Consignment.